Karl Chevrolet is honored to present this one-owner Certified Pre-Owned 2016 Chevrolet Suburban LT Z71 with 65,667 miles. This Suburban was sold new and serviced right here at Karl Chevrolet for its original owner. Just through our shop with FOUR NEW TIRES and new front and rear brakes - this Suburban is ready for a new home. A rare Z71 model in Black exterior with Medium Ash Gray Leather Interior, features include Center Row Buckets, Power Folding 3rd Row Seat, Power Sunroof, Navigation, Dual Screen DVD Entertainment System, Remote Start, Bluetooth, Apple CarPlay or Android Auto, Rearview Camera, Side Blind Zone Alert, Lane Keep Assist, Front and Rear Park Assist, Heated front and middle row seats, Heated Steering Wheel and much more! Another great value from Karl Chevrolet. This Chevrolet includes: ENGINE, 5.3L V8 ECOTEC3 WITH ACTIVE FUEL MANAGEMENT, DIRECT INJECTION AND VARIABLE VALVE TIMING Flex Fuel Capability 8 Cylinder Engine ENTERTAINMENT SYSTEM, REAR SEAT, BLU-RAY/DVD Auxiliary Audio Input Entertainment System MP3 Player AUDIO SYSTEM, CHEVROLET MYLINK RADIO WITH NAVIGATION AND 8" DIAGONAL COLOR TOUCH-SCREEN AM/FM Navigation System AM/FM Stereo Bluetooth Connection Auxiliary Audio Input MP3 Player DVD SCREEN, THIRD ROW CD Player Entertainment System STEERING WHEEL, HEATED, LEATHER-WRAPPED, AND COLOR-KEYED Heated Steering Wheel Leather Steering Wheel PAINT SCHEME, SOLID APPLICATION SUNROOF, POWER, TILT-SLIDING Generic Sun/Moonroof Sun/Moonroof REAR AXLE, 3.42 RATIO LT PREFERRED EQUIPMENT GROUP BLACK JET BLACK/DARK ASH, LEATHER-APPOINTED SEAT TRIM Leather Seats LIFTGATE, HANDS-FREE, POWER Hands-Free Liftgate Power Liftgate Remote Trunk Release FRONT AND REAR PARKING ASSIST Rear Parking Aid SEATS, HEATED SECOND ROW Heated Rear Seat(s) ASSIST STEPS, TUBULAR, BLACK Running Boards/Side Steps KEYLESS START, PUSH BUTTON Keyless Start SEATS, SECOND ROW BUCKET, POWER RELEASE Rear Bucket Seats Bucket Seats SEATS, FRONT BUCKET WITH LEATHER-APPOINTED SEATING Seat Memory Power Passenger Seat Power Driver Seat Heated Front Seat(s) Passenger Adjustable Lumbar Leather Seats Driver Adjustable Lumbar Bucket Seats TRANSFER CASE, ACTIVE, 2-SPEED ELECTRONIC AUTOTRAC SIDE BLIND ZONE ALERT WITH LANE CHANGE ALERT Blind Spot Monitor LUXURY PACKAGE Fog Lamps Keyless Start Heated Rear Seat(s) 3rd Row Seat Power Mirror(s) Heated Steering Wheel Hands-Free Liftgate Rear Parking Aid Heated Mirrors Adjustable Steering Wheel Power Door Locks Keyless Entry Tow Hitch Blind Spot Monitor Power Liftgate Power Folding Mirrors Cross-Traffic Alert Remote Trunk Release Pass-Through Rear Seat WHEELS, 18" Aluminum Wheels OFF-ROAD PACKAGE Fog Lamps Rear Parking Aid Floor Mats Tow Hooks Running Boards/Side Steps PASSIVE ENTRY SYSTEM Power Door Locks Keyless Entry LPO, BLACK BOWTIE EMBLEMS, FRONT AND REAR WIRELESS CHARGING EMISSIONS, CONNECTICUT, DELAWARE, MAINE, MARYLAND, MASSACHUSETTS, NEW JERSEY, NEW YORK, OREGON, PENNSYLVANIA, RHODE ISLAND, VERMONT AND WASHINGTON STATE REQUIREMENTS TIRES, P265/65R18, ALL-TERRAIN, BLACKWALL Tires - Rear All-Terrain Tires - Front All-Terrain TRANSMISSION, 6-SPEED AUTOMATIC, ELECTRONICALLY CONTROLLED Transmission Overdrive Switch A/T 6-Speed A/T STEERING COLUMN, POWER TILT, AND TELESCOPIC Adjustable Steering Wheel SEATS, THIRD ROW 60/40 SPLIT-BENCH, POWER FOLD 3rd Row Seat Rear Bench Seat Pass-Through Rear Seat HILL DECENT CONTROL UNDERBODY SHIELD SUN, ENTERTAINMENT AND DESTINATIONS PACKAGE Navigation System Generic Sun/Moonroof Satellite Radio Sun/Moonroof Entertainment System MIRRORS, OUTSIDE HEATED POWER-ADJUSTABLE, POWER-FOLDING AND DRIVER-SIDE Auto-dimming Integrated Turn Signal Mirrors Power Mirror(s) Heated Mirrors Power Folding Mirrors *Note - For third party subscriptions or services, please contact the dealer for more information. * Your buying risks are reduced thanks to a CARFAX BuyBack Guarantee. This well-maintained Chevrolet Suburban LT comes complete with a CARFAX one-owner history report. Why own a car when you can own a lifestyle? We at Karl Chevrolet offer you nothing less than the best with our Certified Pre-Owned vehicles. This vehicle meets Chevrolet's highest level of standards, allowing us to provide you with what you deserve. Gone are the days of SUVs being the size of a tank and handling like one. This Chevrolet Suburban is a perfect example of how SUVs have evolved into vehicles that are as refined as they are rugged. Put performance, safety, beauty, sophistication, and all the right amenities into a car, and here it is! Now you can own luxury without the luxury price tag! This 4WD-equipped vehicle will handle beautifully on any terrain and in any weather condition you may find yourself in. The benefits of driving a 4 wheel drive vehicle, such as this Chevrolet Suburban LT, include superior acceleration, improved steering, and increased traction and stability. This 2016 Chevrolet is a unique find -- pair it with a Rear Entertainment Package and you have hit the jackpot. Added comfort with contemporary style is the leather interior to heighten the quality and craftsmanship for the Chevrolet Suburban With an efficient and easy to use navigation system, this Chevrolet Suburban will help get you from Point A to Point B in no time flat. Know exactly what you're getting when you take home this Chevrolet Suburban as past service records are included. Pre-owned doesn't have to mean "used." The clean interior of this Chevrolet Suburban makes it one of the nicest you'll find. More information about the 2016 Chevrolet Suburban: The Suburban and Tahoe are by far the best-selling models in their class, and they're tough rivals for the Ford Expedition, Toyota Sequoia, and Nissan Armada, among others. These two Chevy models are closely related in most ways--although there's a key difference: the Suburban is 14 inches longer in wheelbase and 20 inches longer overall than the Tahoe; and that results in a significantly larger third-row seat than in the Tahoe--as well as easier access to it, and more cargo space. Compared to rival models, the Chevy Tahoe and Suburban still stand out for their good ride quality and efficient engines, and they handle surprisingly well considering their size and mass. They're also very rugged and versatile and can be outfitted for off-road toughness, tow ability and interior luxury as needed. Chevrolet claims that the Suburban will be the most fuel-efficient model in the full-size SUV class, thanks to its standout combination of fuel-saving technologies like direct injection and active fuel management (cylinder deactivation). Although the profile of the Suburban and Tahoe haven't changed all that much, Chevy has managed to make significant improvements to aerodynamics. Yet chiseled sheet metal and big, flamboyant wheels (up to 22 inches) help maintain a powerful look. 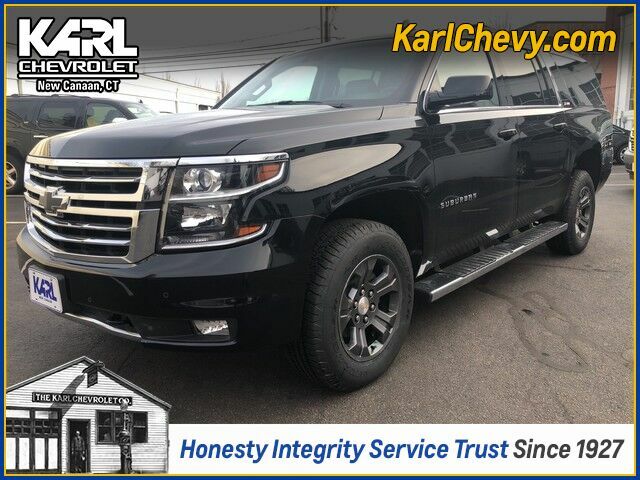 This model sets itself apart with relatively fuel-efficient engines, towing ability, seating space, Much-improved interior, versatility and toughness, and comfortable, refined ride As always, our goal here at KARL Chevrolet is to assist you to find the perfect vehicle to meet your needs. While we strive to have the area's best selection of quality pre-owned vehicles in stock at all times, we know there are times when a customer may have very specific needs. If you have a specific model or features that you are searching for, please let us know. You might be surprised how quickly we can find a match! Just another KARL Advantage .... finding you the perfect vehicle at the best overall value. Thank you for the opportunity to assist in your vehicle search.